Only showing entries about ferry. from Backpacking Europe on fifty dollars/day. View entries about ferry. from all Travellerspoint blogs. We went on a guided tour of the ANZAC battlefield near the small town of Eceabat, just across the Dardanelles from Canakkale. 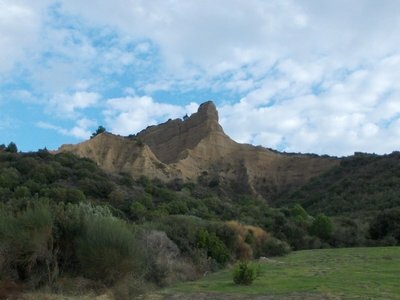 Eceabat is the closest town to the Gallipoli combat zone. We took the thirty minute ferry from Canakkale to Eceabat for two fifty tl each (1.45 Can), effectively moving from the Asian to the European side of Turkey. We stayed at Crowded House Hotel, just a short walk from the harbour. Crowded House is a clean bed and breakfast establishment that provides tours of Anzac Cove for sixty tl each (34 Can. dollars). We arrived at 1130 am and were in time for the tour leaving at 1230. Besides the van driver and tour guide there were only three other people with us, all from Australia. In the first world war the Galipoli penninsula held a strategic location. The Ottoman Empire sided with Germany and the Allied forces were sent in to take the penninsula and thereby gain access to the Black Sea. Over one million troops spent time here. ANZAC stands for Australian and New Zealand Army Corps. They trained in Egypt and were sent over to Gallipoli - they landed on the Aegean Coast on April 25, 1915. 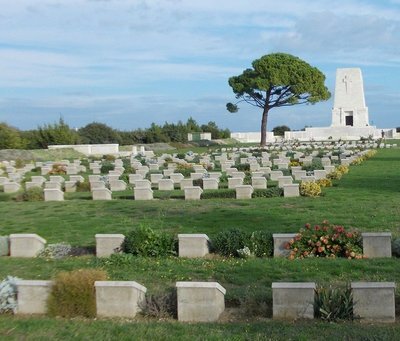 4,228 Australians and 708 New Zealanders lost their lives at Lone Pine where rosemary grows wild. Our tour guide, "Bill," is Turkish and speaks English with an Australian accent, explains things, gives both sides. We stopped at Brighton Beach, it has a different name in Turkish of course, Kabatepe, proceeded to ANZAC Cove, Lone Pine, and the New Zealand monument at Conkbayiri. Forty-nine Newfies died at Gallipoli, there were five hundred thousand casualties and by the time the Gallipoli Campaigne ended over 120,000 people had died including about 80,000 Turks. The whole thing was pretty much a stale mate for nine months in 1915. 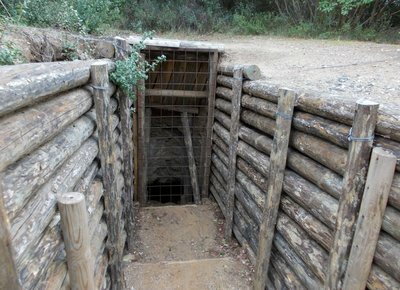 The soldiers were in trenches. In the heat of summer they got a cup of water a day, their clothes were filthy, full of lice, and no man's land was the width of a road. They fought hand to hand combat, it was a blood bath, the last gentleman's war. Ataturk led the reserve battalion that turned the tide of this war and I feel so emotional about the whole thing. 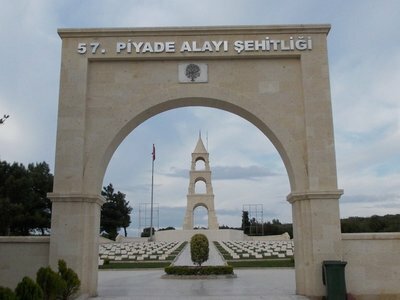 The Aussies and the New Zealanders come here, they suffered huge losses, but the Turks flock here as well as it is a matter of national pride and of course after the first world war there was no more Ottoman Empire. I love Ataturk too when I read what he said in 1934, about the mothers from far away lands that have lost sons here, lying in Turkey's bosom. Very moving. There is a large monument with these words engraved in English at Anzac Cove, cold comfort for the mothers still alive back home in Australia, 20 years after the fact. You, the mothers, who sent their sons from far away countries wipe away your tears. During the Gallipoli Campaigne Mustafa Kamal's life was saved by his pocket watch. His shattered watch is apparently on display somewhere in Germany. The Allies finally abandoned the futile effort and evacuated Sulva Bay and Anzac Cove in December 1915 and January 1916. With no casualties the evacuation was deemed a brilliant success. The Turks say they knew the Allies were leaving and chose to let them go with no more bloodshed. Driving back to our hostel I pondered the futility of war. Along the way we passed a shepherd. Perhaps this was the type of scene common in 1914, before Winston Churchill's ill-fated scheme for the Allies to open a passage to the Black Sea via the Dardanelles. We went from Saffranbolu via Bursa to Cannakkale and then to Eceabat on the Gallipoli Penninsula. The bus from Saffranbolu to Bursa left at 10 am on Sunday, cost forty five tll each and arrived about 5 pm. It cost thirty tl to take a cab to our hotel. We still had not figured out the Metro Service bus option. The hotel in Bursa was wonderful. Clean, modern, hair dryer, slippers, nice linen, lots of towels, wow, so much better wish we could stay a few days. Breakfast is incuded, buffet, lots of choices, olives, tomatoes, cucumbers, hard boiled eggs, cereal, sweet rolls, assorted breads, yoghurt, coffee, tea, hot milk which I use to make latte, really good, we eat on the terrace, lovely. The cost inclusive with fabulous breakfast was 31 Euros. That is about forty two dollars. 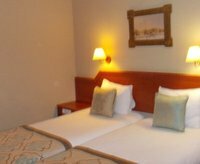 A great deal in our opinion, after the sketchy hostel in Saffranbolu this is luxury. Very clean and modern with a lovely lobby, Boyuguzel Termal Hotel. Bus tickets from Bursa to Cannakkale (pronounced Chen-awk-a-lee) were 30 tl each. We left on Monday at one pm. We took a city bus to the bus depot for two tl fifty cents each, really easy. We are getting somewhat smarter and ask the attendant if there is a service bus in Cannakkale, guess what there is and it is free and it drops us off near Egam Hostel, which was ok but a total let down after our nice hotel, kind of noisy also. The owner there wants us to book a tour to Gallipoli with his friend down the street, but the notebook all of a sudden kind of charged up to over forty percent so I got on line and booked us into Crowded House in Eceabat, right on the Gallipoli peninsula, for the next day. Of course, you can get to Cannakkale from Istanbul, it would be easier than our route from Saffranbolu!! One turkish lira is about fifty seven cents Canadian at this time. Population of Cannakkale is about 100000 and Eceabat is less than 10,000. Crowded House was forty Canadian a night and had a good breakfast, Egem Hostel cost the same but was not as nice.